Like Kristen’s workout, you add on as you go. But, unlike Kristen’s workout, you don’t add on after each time through the circuit. Instead, you add a new move on every five minutes. So, those first five minutes, you’re doing a lot of burpees and wall ball. And then, once you get into the second five minutes, you’re doing burpees, wall ball and kettlebell swings. 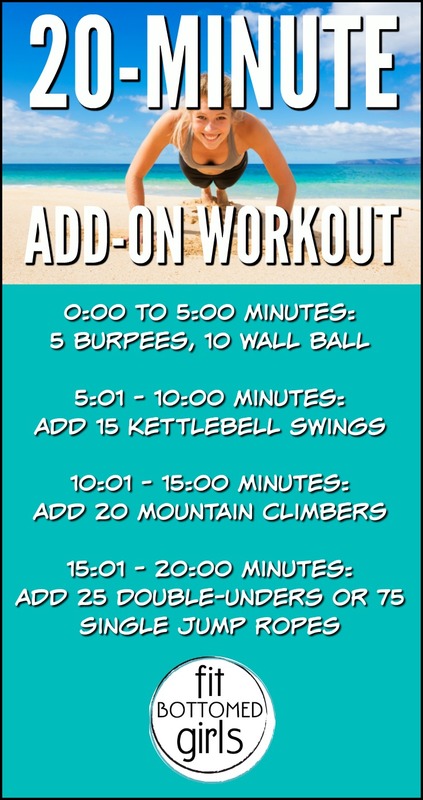 Between 10 minutes to 15 you’re doing burpees, wall ball, kettlebell swings and mountain climbers. Then, for the final five minutes you’re doing all of that plus jumping rope. Looking for a no-equipment version of this workout. Oh, I got substitutions. No excuses — you can do it! Really anyone can do theses exercises without making any excuses. Thanks a lot for sharing. keep up the good work.